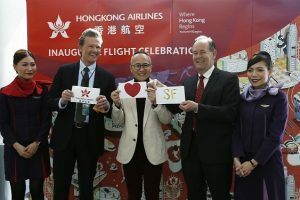 Hong Kong Airlines celebrated the launch of its new A350 service to San Francisco yesterday. The City by the Bay becomes the airline’s third destination in North America, following the successful launch of services to Vancouver and Los Angeles in 2017. 2018 as the “Hong Kong Airlines Day in San Francisco”. Kong Airlines is relatively new to the North American market, we are committed to offering a value proposition to our customers, including the deployment of Airbus A350, one of the most technologically advanced aircraft in the world, and ensuring customers enjoy an exceptional inflight service delivered by our energetic crew. on Hong Kong Airline’s Los Angeles – Hong Kong route in the months ahead. lined with bold-coloured fabric, featuring birdcage, teapot, rice bowl or the Hong Kong city skyline.